If you believe the hype coming out of Silicon Valley in recent years, the transportation world is about to experience its biggest disruption since the motorcar replaced the horse-drawn carriage at the beginning of the twentieth century. Within the next two decades, corporate giants such as Google, Uber, Tesla, and Ford will roll millions of autonomous vehicles onto our streets, roads, and highways, with some very serious implications on the way we design our cities, not to mention how we live our lives. Those who study the issue tend to fall into two camps. The first, more optimistic group believe driverless cars will complement existing walking, cycling and public transit options, reduce the number of vehicles using our streets, increase safety and mobility options, and free up public space currently used for parking. The second, more cynical crowd fear automated vehicles will induce longer commutes, sprawling development, compete with walking and cycling, and reduce investment in high capacity transit. While the reality will likely fall somewhere in the middle of those two extremes, local and regional governments will play a crucial regulatory role in shaping our driverless future, and it seems many are woefully underprepared for its imminent arrival. When the National League of Cities conducted an analysis of transportation plans for the 68 largest U.S. communities in late 2015, just four of those documents had considered the potential effects of driverless technology. Taking its reputation as a North American leader seriously, the City of Vancouver’s Transportation Division has now started to consider the various ways that driverless cars will impact their important work. “In April 2016, Council asked us – as staff – to report back on the current affairs around automated, connected vehicles, and to suggest ways we can be more proactive as the technology evolves,” recalls Dale Bracewell, the City’s Manager of Transportation Planning. Bracewell and his team spent the next few months researching the challenges and opportunities presented by autonomous vehicles, including the commission of a comprehensive, 93-page report authored by UBC SCARP (School of Community and Regional Planning) grad student Cail Smith, and funded by the Greenest City Scholars program. 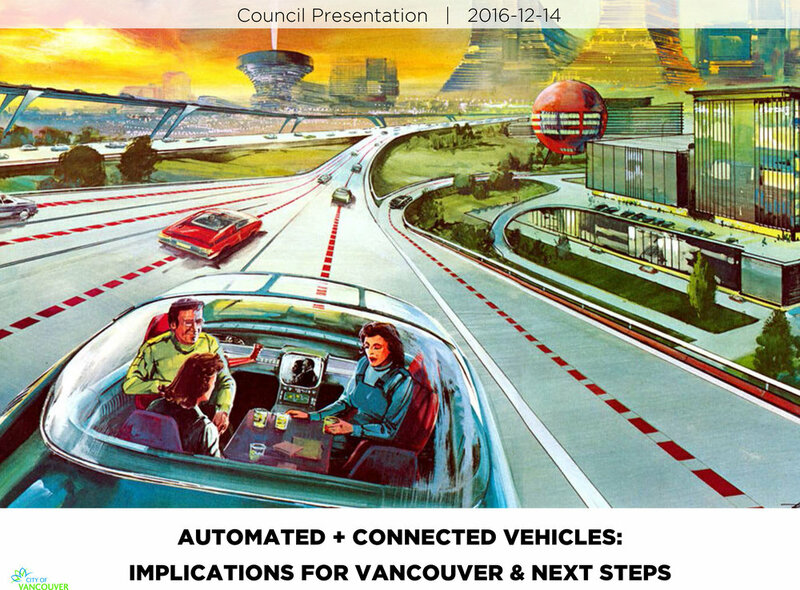 The resulting 27-slide summary – created by Senior Transportation Planner Paul Krueger – entitled “Automated and Connected Vehicles: Implications and Next Steps”, was presented to Council during their final session of 2016. Central to that Transportation 2040 plan – passed unanimously by Council in October 2012 – is a key policy direction that explicitly prohibits a net increase in motor vehicle capacity on City of Vancouver streets. Once driverless dreams become a reality, this creates an exciting opportunity for building complete streets that include wider sidewalks, protected bike lanes, and bus rapid transit lines. Of course, City staff remain committed to complete streets regardless of the impacts of this technology. But if the vast majority of cars are shared – all but eliminating the demand for on-street parking – these improvements can be implemented in an accelerated and less controversial manner. This is particularly important for risk adverse politicians. As we’ve experienced again and again, the expectation that every driver should be provided with cheap and convenient on-street parking has become the single biggest barrier to building a more liveable city. With so much at stake, government officials are beginning to recognize that they must lead this planning process, and not the aforementioned corporate giants (along with their seemingly infinite resources). In response to this uphill battle, transportation leaders such as Bracewell are pooling their resources and knowledge with other departments across the continent. “Regionally, TransLink has provided effective leadership on this issue, writing a report on ‘The Future of Driving’, which gave us an opportunity to engage with other municipalities on their own goals; especially around safety, road pricing, and expanding transit service,” says Bracewell. Unsurprisingly, the provincial government is notably absent from these discussions, illustrating the growing gap between the Mayors’ Council’s vision for a vibrant, transit-rich region, and their own pursuit of one that puts the private automobile at the top of the transportation hierarchy. What excites Bracewell most about the impending driverless disruption is how it allows his team to suddenly accelerate their plans, and reach the stated goal of increasing walking, cycling, and transit to two-thirds of all trips long before 2040. Visionary Mayors such as Paris’ Anne Hidalgo, Madrid’s Manuela Carmena, Oslo’s Marianne Borgen, and Helsinki’s Jussi Pajunen are rethinking their city centres as a series of linear parks and promenades. Time will tell, but we hope the rise of automated vehicles leads to more, rather than fewer of these brave interventions. Opportunities such as this come along once in a lifetime, and it would be a tragedy if we didn’t seize it to challenge the current practice of designing our cities around the motor vehicle, and start putting people first.